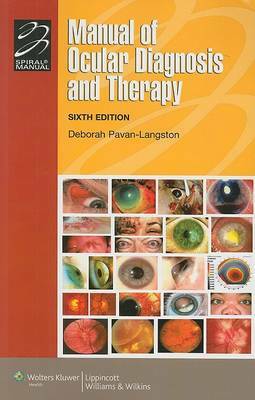 Thoroughly updated for its Sixth Edition, this manual is a highly practical guide to the diagnosis and management of eye disorders and injuries. Experts from Harvard Medical School and the Massachusetts Eye and Ear Infirmary present authoritative, state-of-the-art recommendations in a rapid-access outline format. Appendices include up-to-date ophthalmic drug and systemic antimicrobial formularies with dosages. All chapters have been updated to include the latest information on new disease entities, diagnostic techniques, drugs, and treatments, including LASIK and LASEK surgery, cataract extractions, intraocular lenses, use of botulinum for blepharospasm, and medical treatment of glaucoma. Thirty new full-color images have been added.